Mark Monfils directing a rehearsal. Photo courtesy of Access World Productions. The Minnesota Fringe Festival, which opens on Thursday, features 164 different productions presented by hundreds of amateur and professional artists. 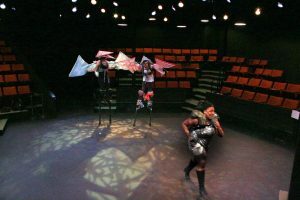 Theatre veteran Mark Monfils is one of those artists, directing Songs for a Post-Apocalyptic World and Thor: Jurassic Park. The Arts Reader‘s Hanne Appelbaum interviewed Monfils about his directing idols and translating comic book influences into Fringe. What is your hometown? Where did you study? Minneapolis (or the Twin Cities metro area) since 1960; Wausau, WI before that. University of Minnesota, Theatre Arts and Spanish majors. How long have you been working in theatre? Over 50 years. My first summer of professional summer stock was at the Lake Nisswa Playhouse (Nisswa, MN) in 1967. What process led you to the director’s chair? Directing was a natural progression when you find you love all things theatre. One way or another, I’ve done pretty much every job available to do in a theatre setting. Directing was where I settled in – something about the “Pay no attention to the man behind the curtain” and the satisfaction of watching a show, knowing “I helped ‘em do all that” as the audience laughs, or gasps, or sits in rapt silence, leaning forward. Who are some directors’ work (past or recent) that you very much appreciate and why? A scene from The Hypocrites’ All Our Tragic. Sean Graney of The Hypocrites, a wonderful Chicago theatre company that takes on gargantuan projects. I was fortunate enough to get down to see their critically acclaimed All Our Tragic in 2014, a 12-hour tour-de-force combining all 32 surviving Greek tragedies! It won the company six 2015 Equity Jeff Awards in its first year of eligibility. I already have two tickets booked to see their next major production in 2018: the 11 comedies of Aristophanes, adapted into a 4.5-hour marathon event! Ya gotta love The Aristophanesathon! Graney’s style of no-holds-barred, crazy, broad yet subtle characterizations is what it’s all about. 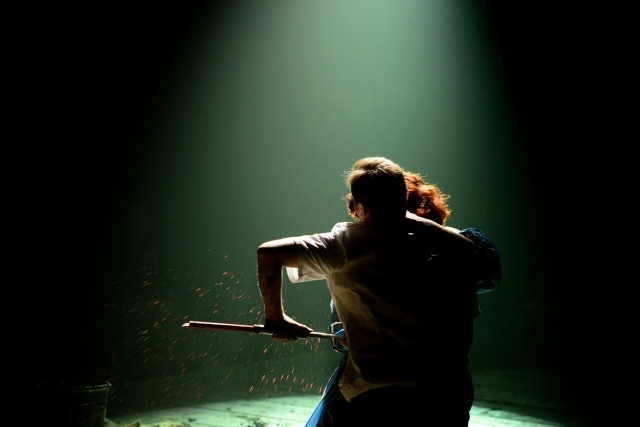 Theatre should be theatrical! 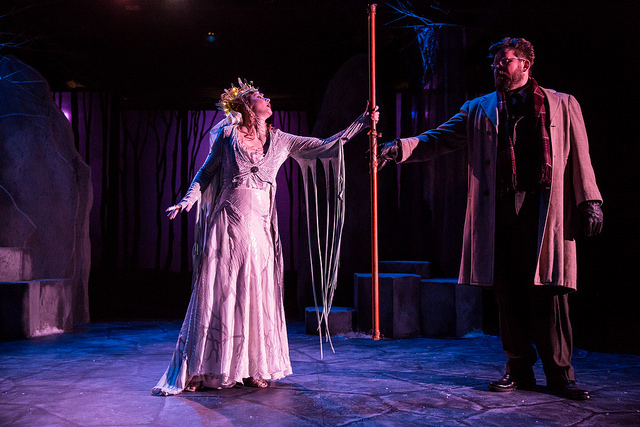 A scene from Walking Shadow Theatre Company’s A Midwinter Night’s Revel. Photo by Dan Norman. [In town], John Heimbuch and Amy Rummenie at Walking Shadow Theatre Company are always doing interesting and fascinating theatre. I really try not to miss any of their shows. John and Amy’s A Midwinter Night’s Revel was pure delight! 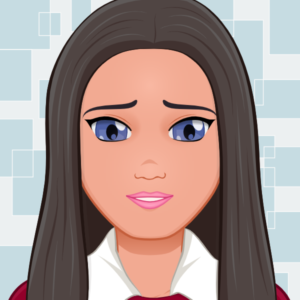 Imagine that – a new play in verse! For the craziness that is all things Fringe, he’d probably use his “Rise above it!” exhortation. 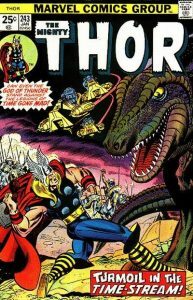 Thor takes on a Tyrannosaurus in Mighty Thor #243. Art by Gil Kane. What was the genesis of this show and how did you get involved in it? 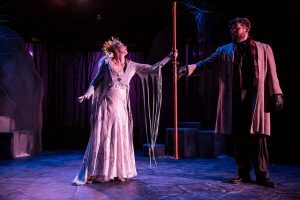 Playwright Basil Considine and I had collaborated on his production of Game of Thrones: The Musical at last summer’s Minnesota Fringe. He asked if I would be interested in directing his newest mash-up romp, Thor: Jurassic. Well, with 18,000 comic books in a collection taking up the entire third bedroom, how could any sane director say “no”? What kind of challenges have you faced working with such a complex show? It’s the standard 21st-century conundrum of building a workable rehearsal schedule around 12 peoples’ outrageously busy lives! While one would think that with 26 scenes it would be easy to work out a French scene schedule, alas, 80% of scenes are not much more than two minutes long – but we’ve managed. 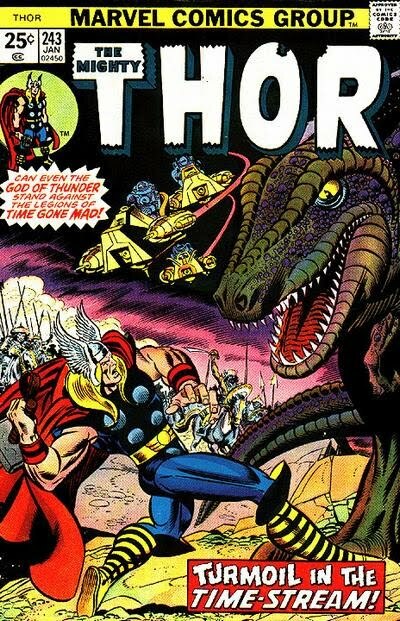 Thor: Jurassic Park is a really fast-paced adventure farce – and such things [i.e., short scenes] happen when your superheroes are chased by the likes of velociraptors, or a T-Rex! Falcon (Christy Johnson) runs from a pair of pterodactyls (Sarah Chapman and Meera Stafford) in a rehearsal for Thor: Jurassic Park. What’s your 30-second show pitch? Sound Cues: Way too many. Get your tickets now while they last – they’re gonna get eaten up! Thor: Jurassic Park opens Friday, August 4 at 5:30 pm at Theatre in the Round. Additional showtimes: Saturday, August 5 at 2:30 pm; Monday, August 7 at 7:00 pm; Wednesday, August 9 at 8:30 pm; and Saturday, August 12 at 5:30 pm.